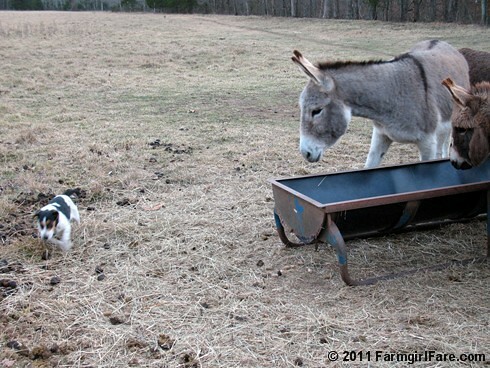 Farmgirl Fare: Monday Dose of Cute: Welcome to the Farm, Little Fella! Monday Dose of Cute: Welcome to the Farm, Little Fella! The other day Joe reminded me that it's been a long time since I've told a farm story, so I thought I would share one. . .
First day on the farm. Morning walk in the hayfield on December 31st. Joe called it a rescue mission. We hadn't planned to bring a new dog into our lives right now, especially another beagle. In fact, after my dear 13½ year old Robin died while I was in the hospital last summer, I wasn't sure if I would ever be ready for another beagle. 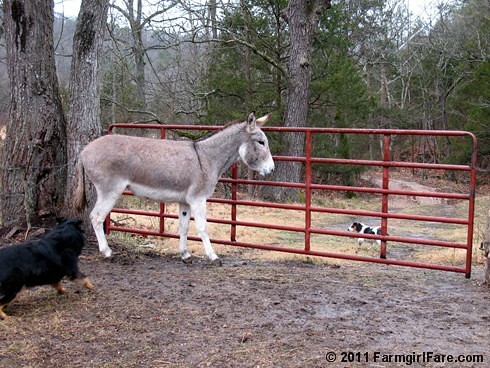 But leave it to that donkey peddling cowboy, the one responsible for our having not only Donkey Doodle Dandy, but also our beloved Australian/English Shepherd stock dog, Lucky Buddy Bear. And since I can't imagine how empty this farm would be without Dan and Bear, I was an easy sell. Then there's the fact that this cowboy is also a professional auctioneer, which means he's spent years convincing people to pay more than they intended for something they probably didn't know they desperately needed in the first place. And this puppy was going for nothing. He called on the evening of December 26th, and after Joe picked up the phone and listened for about 20 seconds he said, "You may as well just talk directly with Susan," and handed me the receiver. I couldn't quite decipher the look on his face. It may have been deep, abiding love for me—or resignation. This was the deal. 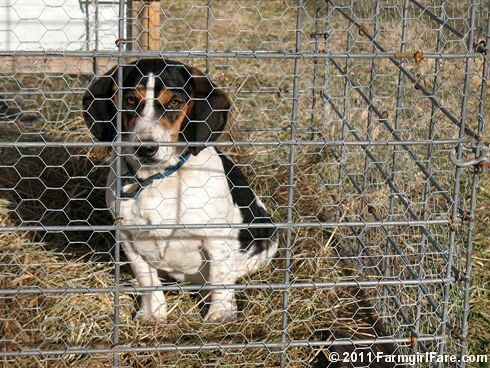 The cowboy had a pair of beagle pups about six months old that he and his seven year old son had been raising up to be squirrel and rabbit hunting dogs, but this little guy just wasn't cutting it. "We took him out for some trials today, and he's not interested in hunting. My son spoiled him when he was young, carrying him around and playing with him all the time, so now the dog thinks the boy is who he should be paying attention to, not the rabbits. And since you'd mentioned a while back that you were looking for another beagle"—had I really said that?—"I thought you might want him. There's no obligation of course, I just figured I'd call and tell you about him. I know you'd give him a good home." There was also an ulterior motive at work here. Despite constantly being surrounded by dogs—I believe the current count on his farm is fourteen—the donkey peddling cowboy is actually sort of afraid of them. He'll be the first to admit it, and he jokingly (I think) refers to Bear as Killer whenever he comes through the farm, which is fairly often since his father grew up here and his family has hunting cabins on the adjacent land (we own 240 acres, but the original property was bigger). He also knows that—as impractical as it would be here—a part of me secretly longs for a giant Rottweiler. And he's really scared of Rottweilers. When he called me back in early 2002 about an accidental litter of Australian/English Shepherd pups that desperately needed homes, knowing I was looking for a dog at the time, it was no coincidence that they just happened to have remarkably similar coloring to Rottweilers, but were a whole lot smaller and less frightening. "Oh, and his tail isn't quite right. Something happened to the end of it when he was small, and it got a crook in it. But it just kept curling, and now it's curled all the way back in on itself." "Is there anything else wrong with this dog you wanna tell me about?" "Can I come over and meet him?" I had a feeling he was planning to load him up and deliver him to us that evening, sight unseen. "Sure. He'll be in the far kennel pen with his brother and his mother. The pup we're keeping has the blue tick spots on him. Yours is the pudgy one." I hung up the phone and beamed at Joe. I tried not to squeal. I suggested that maybe we should go check out the puppy that night. He convinced me it would be better to meet him during the daytime. And we just happened to be going in that direction the next day. Nobody was home when we arrived, but I quickly zeroed in on the puppy, picked him up, and carried him out of the pen. He was definitely cute. 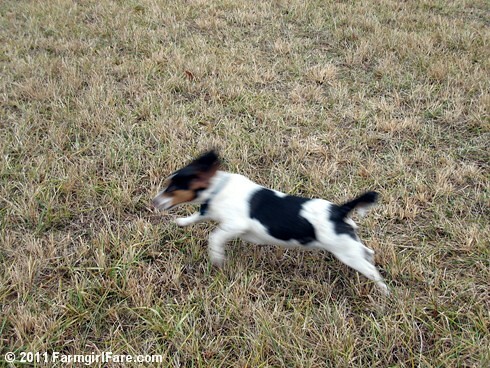 I watched as he romped around and played with one of the other dogs. It felt kind of wrong to be contemplating another beagle. Joe looked at me. "You want him, but you feel like you're replacing Robin," said Joe. "Nobody is ever going to replace Robin." "I know." I blinked back tears. "So what do you think?" "I think he's a beagle who needs to be rescued." "And he is pretty cute." The cowboy's wife and two little kids pulled up just as we were about to leave. "Are you going to take home my beagle?" asked the boy, who happens to be my favorite little cowboy. "We didn't want to take him with us in case you wanted to say goodbye first." "I'll go get him!" 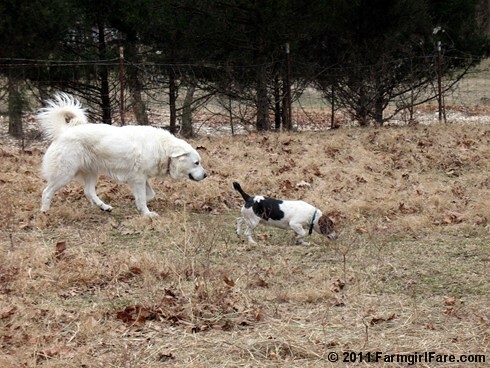 He raced off toward the kennel and came back awkwardly carrying the puppy. "He's kind of a chunky little thing," I said. "He's as fat as a tick," said the wife. 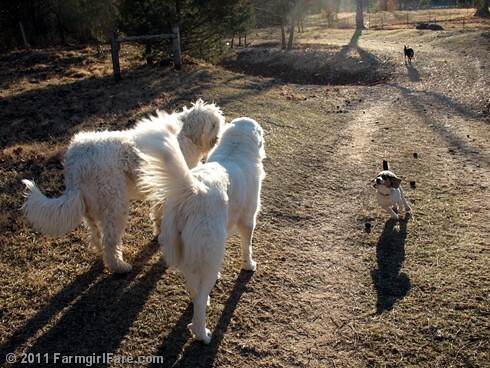 "Do you think he'll chase chickens?" asked Joe. "The only thing he'll chase is a scrap." The kids wanted to show me the bed tents and lariats Santa had brought them, so we all trooped into the house. "The puppy can't come inside," the junior cowboy informed me. "He stinks." I set him down on the square cement porch. "Will he stay if we leave him here?" After I'd checked out all the Christmas loot (is there anything more adorable than a size itty bitty pink roping glove? 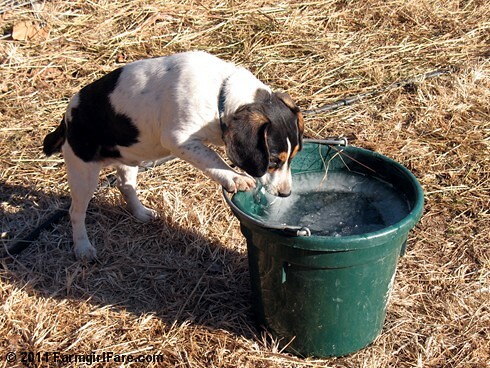 ), the cowboy kid and I left Joe chatting with the wife and went back outside to find the wayward pup. After we'd unsuccessfully checked all his known hiding places, he finally trotted out of some tall grass with an enormous beagle who looked about 140 years old. "Wow. How old is that dog?" The kid picked up the puppy and started lugging him back towards the house, telling me everything the dog wouldn't do as we walked along. "Is there anything this puppy does do well?" "Not really. But you never want to sell him—in case you ever have a mole problem." I burst back into the house. "That settles it! We're definitely taking this dog." "What," Joe said, "did he pee on you?" "He does," said the wife. "He does!" said the kid. And we loaded my new puppy into the truck. SOLD to the little lady with SUCKER written across her forehead! 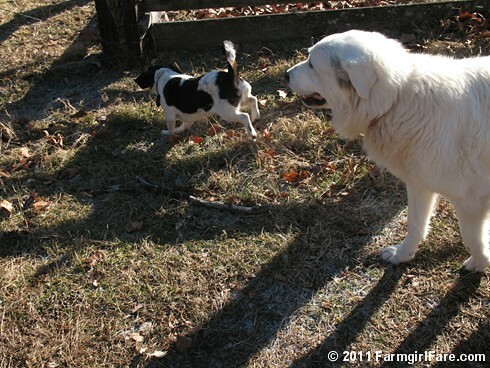 He rode the half hour home on my lap, and by the time we pulled up to the farmyard gate, Daisy and Marta and Bear had gathered around the driver's side of the truck. 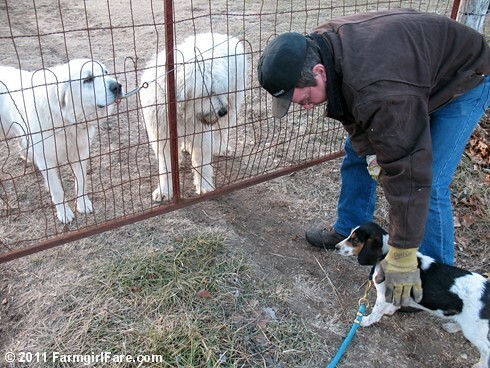 "You'd better take him out and introduce him to the big dogs," Joe said. I carried him around to the dogs and crouched down. Bear whined. Daisy growled. Marta opened her enormous jaws like she was going to eat him. The puppy's eyes got very wide, and then peed all over me. The kids had named him Duke, but he didn't respond to it. And as much as I loved the idea of having a Duke of Squirrel, the name Duke didn't really fit him. A few days after he arrived I decided to call him Bert, and it suits him perfectly. His full name is Bert the Duke of Squirrel, although Joe says he probably thinks it's Bert NO. 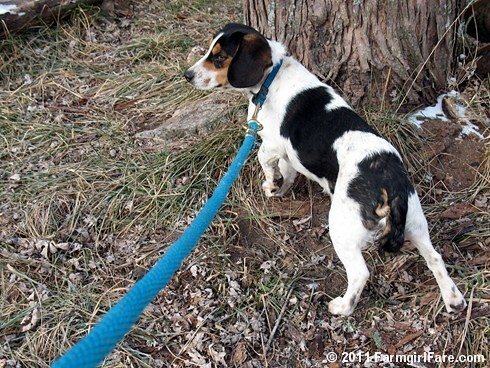 His bent tail looks a little odd, especially for a beagle, but I think it just makes him that much more endearing. He yelps if you touch it or the leash gets caught on the curl, so when we take him to get neutered we'll ask the vet about snipping off the injured end. The good news is that it wags just fine. As far as only chasing scraps, it turns out that part wasn't exactly true. 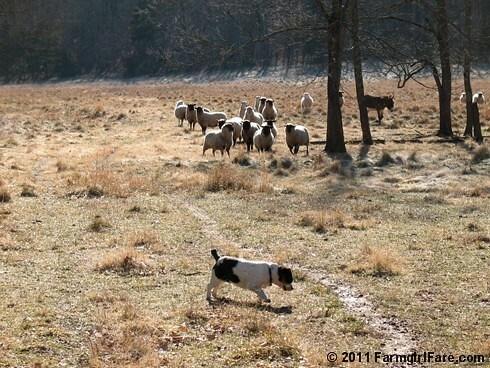 Bert will chase anything that moves. Like cats. And sheep. And chickens. And even donkeys. He's usually just trying to play, because what Bert likes more than anything in the world is to be chased. Unfortunately not everybody understands his puppy language—or enthusiasm. Let's just say he knows how to exit Donkeyland in a hurry. 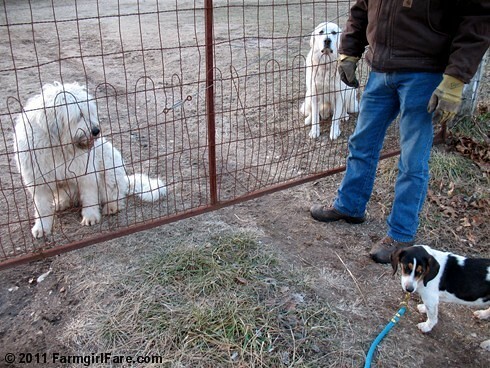 Bert stands by while I let the sheep out. There's never a shortage of puppysitters around. Right now Bert spends a lot of time on the leash (I haven't walked a dog on a leash in 16 years! ), and despite the assumption that he would be an outdoor dog, he spends even more time in The Shack. 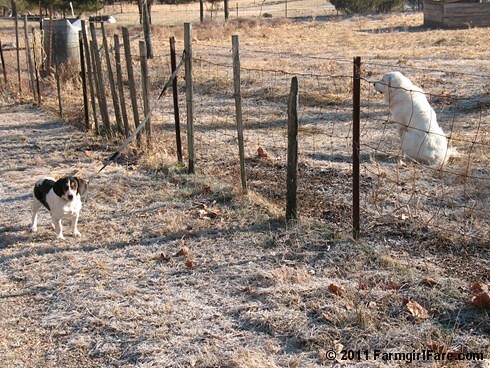 (Beagles would much rather be running around the farm than cooped up in the house.) He has blankets and beds in various places, including right next to the woodstove. Last night he curled up on a cozy pink blanket next to my side of the bed, using one of my socks for a pillow. Chewsticks and bones and toys, including the cool rope toy Joe made him, are scattered everywhere. For now, it's simply the safest place for him to be. 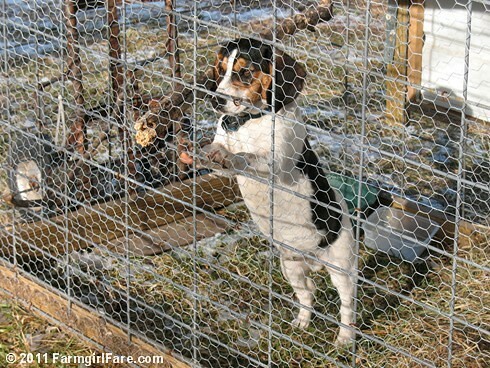 While we were out running errands for eight hours on Friday, we left Bert locked in his chicken wire-encased steel puppy pen (formerly known as our first experimental chicken tractor) where he had spent his first four nights here without incident. We arrived home Friday evening to find the chicken wire on the pen torn apart, Bert running around free, feathers everywhere, and a slaughtered young hen in the yard. I'd conveniently forgotten until Bert's second day here that one of the main reasons we'd never let any of our chickens run around loose until recently was because of Robin, aka the one responsible for the naming of Unlucky Clucky. I had already ordered a remote controlled training collar, and I have high hopes for bad little Bert. For the most part, things are going really well. Marta Beast no longer wants to eat him, and the cats and sheep are starting to accept him. 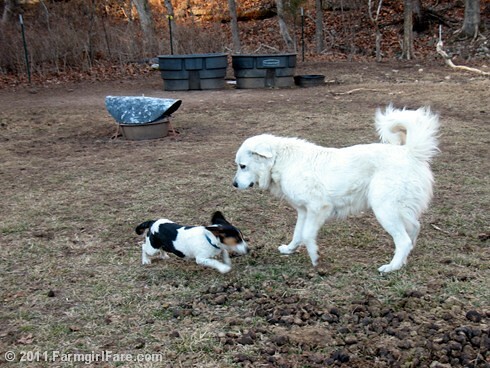 He's Bear's new sidekick and wrestling partner (he adores Bear), and he's even managed to get Daisy to chase him. He accompanies me pretty much everywhere. He's only eaten one library book, Barefoot Contessa How Easy Is That?, which I had conveniently already ordered for myself after bookmarking 54 recipes I want to make. (I figure the library and I can simply swap copies.) When I walk into the living room each morning, he races over and makes ridiculously cute little happy noises. As Joe's dog loving sister reminded him on the phone last week as he was regaling her with tales of Bert's various escapades, "He's a puppy!" She's right of course, but it's easy to forget. It's been three years since Lottie and Marta—who couldn't be contained anywhere—arrived here as little fluffballs. Bert has won over my heart, and I suspect a part of my hunky farmguy's as well. And as Joe pointed out yesterday while we were in the kitchen and Bert was quietly gnawing on a bone in the living room, "He's actually a remarkably well behaved puppy." He is. He has a charming personality and has already become an integral part of the family. And of course he's as cute as can be. I know we were right to adopt him. 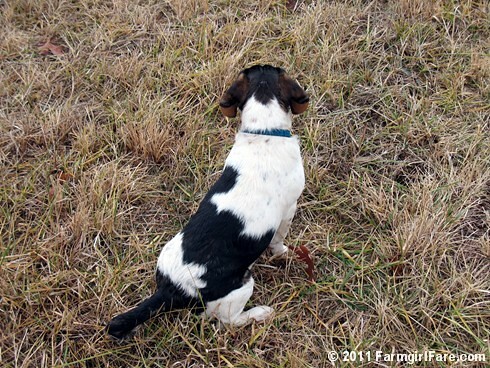 It sure feels good to have a beagle back on the farm. 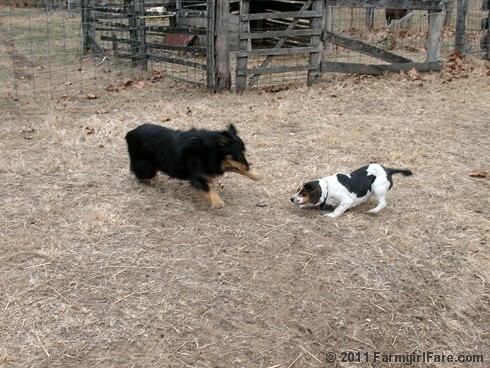 9/19/09: Bye Bye Sheep Barn! © FarmgirlFare.com, the young at heart foodie farm blog where after two weeks, the consensus around here is that Bert has more energy than the rest of us put together. Puppies! ahhhhhh he is so adorable! Love that fat little puppy belly! Congratulations to all, Susan! Really - is there anything better than a puppy? 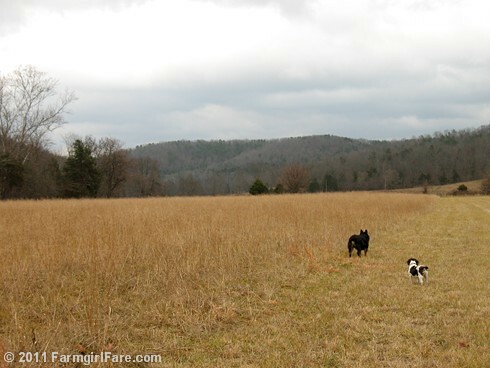 A home (and a farm) is just a better place with a dog(s) - I am so happy for all of you. I love the story of how Bert came to live with you and Joe and all the animals - may you all have a wonderful, happy life together. Wonderful photos - thank you so much for sharing them with us! You will have so many laughs with Bert around. He seems like quite a pup....and seems to be fitting in quite well (in the shack too)...He is one lucky dog! I love your story and the photos of course. A beagle graced my life for 14 years and those years were an adventure. They can be rascals and chowhounds...but they are simply the happiest of dogs. Those big eyes and floppy ears will melt anybody. And the crooning...one can get used to it as you (probably) already know. Congratulations! Bert is as cute as can be and he is lucky you found him and he found you! What a lovely farm story. Maybe Bert can star in his own series on tracking and capturing moles. How does that work, anyway? And what does he do with the remains? Do you rent him out? He is just adorable but I admit I'm glad its you and not me going through the 'puppy' stage!!! He is a cutie - loved the story! Yay for fat puppies! Bert is adorable. Congrats! Well, he'll never replace Bear as my favorite canine buddy, but I have to admit he's an extremely appealing little dude. And I love the name. Puppies - can't be beat unless it is by kitties AND puppies - oh yeah and baby chicks and lambs and goats and donks - never mind. Wonderful story - Bert is where he belongs and Duke of Squirrel is superb. I have a goat we named YoYo - her mother is one of my favorites in the herd (she is named Norman and that is a long story) and now Norman is YoYo's Ma! Yes I do like cello why do you ask? Much warm regards to all at your place in this cold weather - from North Texas where unfortunately tonight it is also cold! Bert is such a cute puppy. I know that you and Joe will have alot of fun with him. Congrates. Oh so excited for you with the new puppy! We survived our first year with an incredibly naughty Boykin Spaniel puppy who chewed everything in sight (how do they get that radar for your favorite things????) and has a penchant for dragging my lingerie through the living room (only when other people are there, of course). But you know she makes me laugh pretty much from the moment I wake up every day, just a wriggling furry ball of delight, and who can put a price on that??? Have lots of fun with Bert and post more pictures soon!!!!! 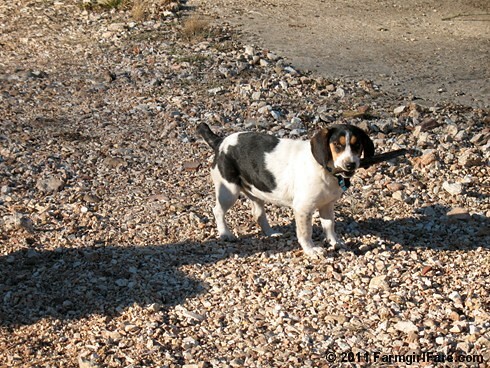 I miss my beagle boy every day, and seeing your Bert - who, in case you haven't noticed, has the devil in his eyes! - makes me think maybe we need a hound puppy around here. What a lucky puppy! I am looking forward to reading more about Bert's adventures! I just found your blog and I just can't stop reading! We have a small farm in TN and love it. We have a beagle/corgi mix and he, too, house-trained himself, lol. It MUST be a beagle thing. Congratulations on the addition of Bert to your family! He's an adorable little guy. I just read your post on coyotes and can say that we share your pain. 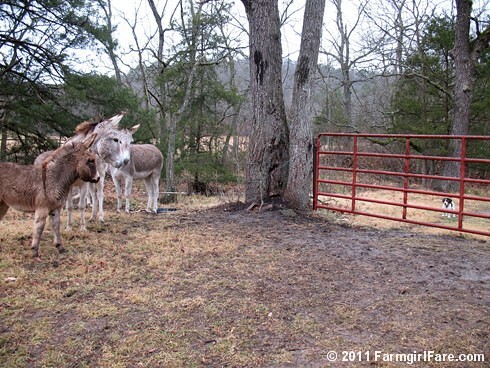 Six days ago, coyotes killed our 31-year-old donkey, Jed. I'm sorry you lost so much to those pests. We'll be adding a llama to our pasture as we have 3 rescued TWH mares that came to us pregnant (holy cow) and we want to keep those babies as safe as possible! I can't wait to catch up on all your posts! Love the name - Bert! I'm sure there will be lots of fun stories to come from this little one! He's cute! Luv us some beagles too. Bert is a treasure. If we lived closer I would rent him for a day or so for moles. I need a ratter or "moler" I must have 10 moles in my yard. I did not want to use poison so got a company that set traps. 3 months and only one mole, lots of money and not a square foot of my yard that it is possible not to break an ankle because of tunnels. Come spring, after they and their entire extended families breed I'll proably be into double digit moles. Bert seems to be the answer, but alas, too far away. As to his tail, I had two cats at different times that we needed to have tails bobbed. It looks funny but healthy for the animal as you know, and less painful. Will be interested seeing his tail trim pictures. I need "dose of cute" Thank you for the effort showing us your farm. Not only a "Monday Dose of Cute," but a "Welcome Breath of Fresh Air"! What a wonderful story, what a good home (and good 2- and 4-footed family) for Bert. Thanks for sending a bit of the farm to my bit of rural-ish Central CA. Oh gosh, I knew half the story already but it still filled me up just reading it...I think it was Robin who decided you needed another Beagle. WOW what a great story. did not realize how much i too missed your stories. Thanks Joe. I can see how you fell in love with Bert!! he is very cute!!! I LOVE how you tell a story!!! Love the story and really enjoy your blog. I just discovered it over Christmas. There is an old movie called "Biscuit Eater" you should see. It's about a boy and his dog that will only chase after his own dinner. Not great acting but it reminded me of your story. Funny. Fat as a tick indeed! I love your farm stories and I love the animals. 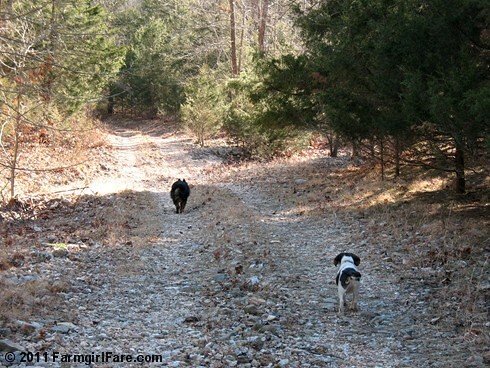 I am so happy for you, and for the beagle boy :) the action shot of Bear & Bert is awesome. Bert is adorable! We have a beagle girl named Georgie - never a dull moment! I love people who understand dogs and don't get rid of them when they kill a chicken or tear something up! 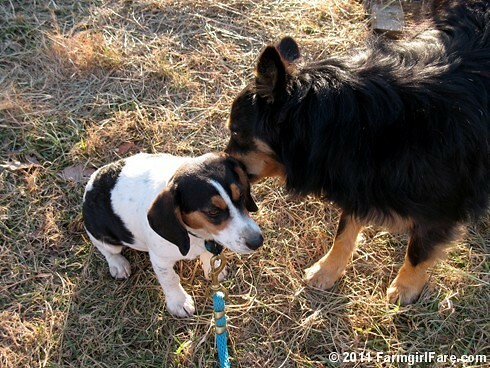 I know he'll be a great farm dog with some training and a great hearth dog for his family. Evidently my beagle baby, Ella, didn't get the house-training gene. She is 4 yrs. old and STILL has accidents. Ells is also a rescue from an abusive home and she is a sweetie. So eager to please, so darn cute. Good luck with Bert! Love your new beagle! 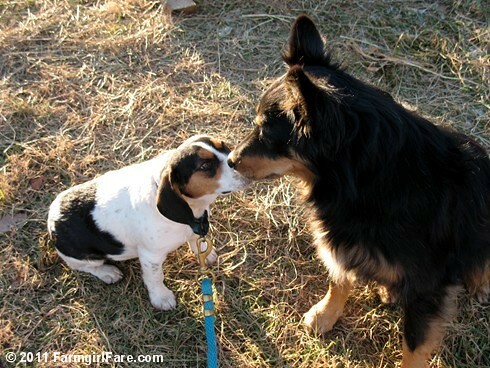 Your story and dogs remind me so much of our little farm with lots of dogs, cats, horses, and donkeys. We have a beagle influenced dog that was dropped off at our house and she has been the best dog ever, she is like my child. I just found your site and will definitely be coming back to see you! 1. De-worm if you haven't already - that belly looks seriously rotund! 2. Please no shocking collars until he's trained. E-collars are meant to enforce commands that have been learned. He's a puppy (baby!) and still learning the ropes :) You wouldn't blame a baby who colored on the wall with crayons, you'd blame the parent who wasn't supervising and left the crayons out - same goes for puppies and chickens.